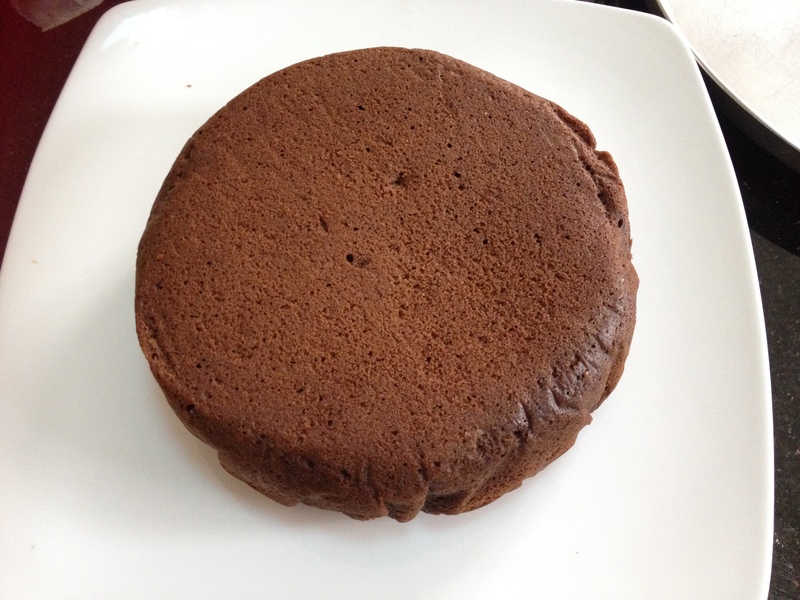 I have already posted a basic eggless chocolate cake previously with yoghurt (dosaikal.com/eggless-chocolate-cake/). This one is also 100% whole wheat, no butter and no eggs – but with condensed milk for a richer, more moist texture. 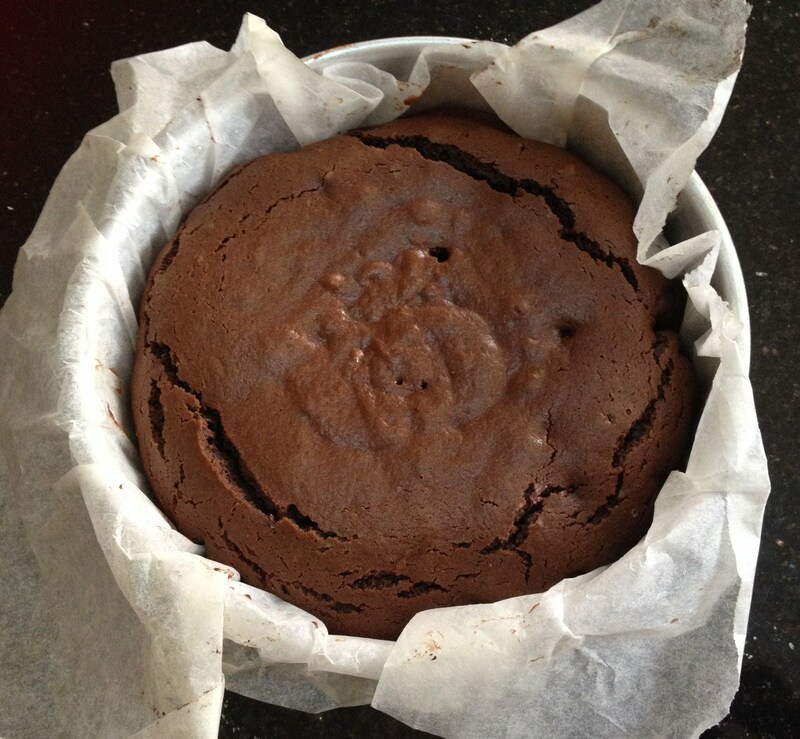 I wouldn’t term it as a very healthy cake – this time I give it up for a little indulgence. Of course, helps my daughter not to be tempted to the best bakery in town for white flour buttery chocolate cake. Except for a few alien souls on this earth, most of us would relish chocolate cakes or even more chocolate frosted/iced cakes and pastries. 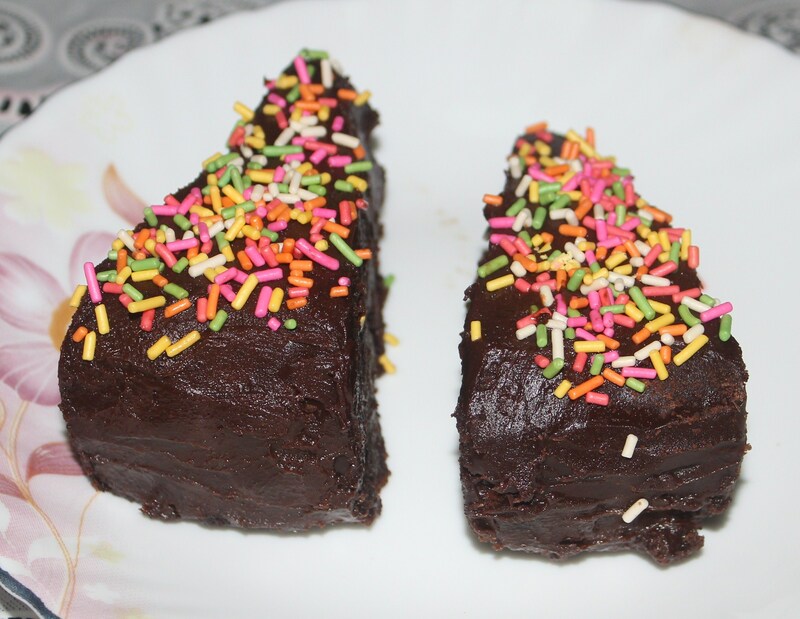 With home made vanilla, banana, carrot or chocolate cakes – such cakes from the baker have not been really a hit at home these days – thanks to my little one’s magnanimity accepting my version of cakes! Now, what next when you go to a coffee shop for a break for Ice Chocolade, the choice is from donuts, croissants or choco frosted cakes or pastries. 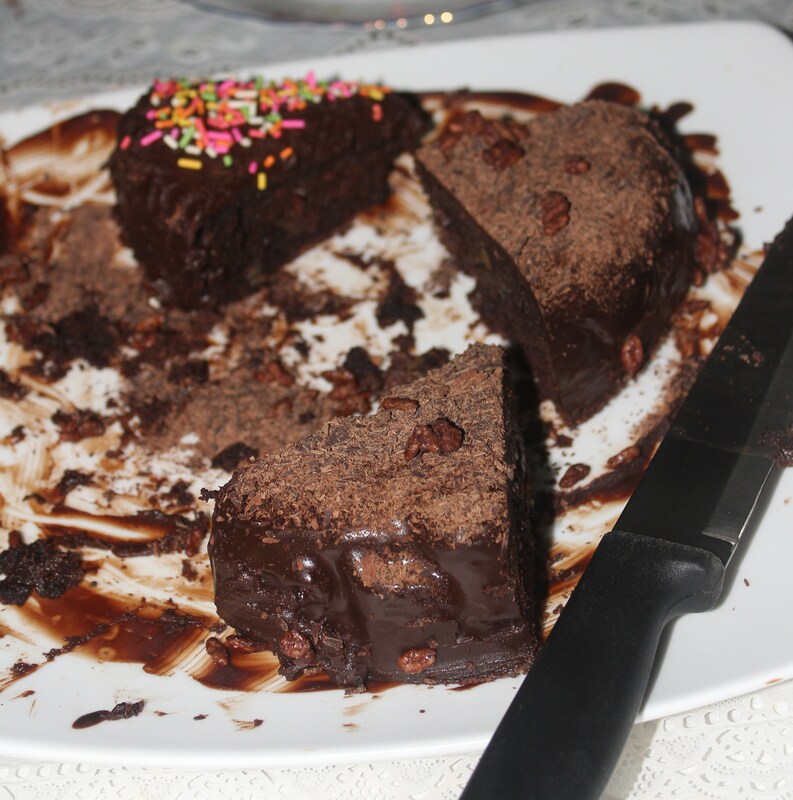 Donuts are a big NO and Croissants are once in a while alright – but with Choco Frosted Cakes – I am lost myself!! Then, the little one has the best company of the mother and we indulge together – then the guilt is only mine. The little one’s inbuilt innocent mechanism digests it so well! That’s what happened last week – A break with Ice Chocolade and Chocolate Cake with Chocolate Ganache! Then, I promised her I shall try at home. I strongly believe icing is for those ‘yogic souls’ with great concentration. Icing is not my cup of tea or my piece of cake – though the piece of whole wheat cake is mine. But melting chocolate blocks and pouring on top of a cake is easier, the only problem being the finishing touch of perfection. 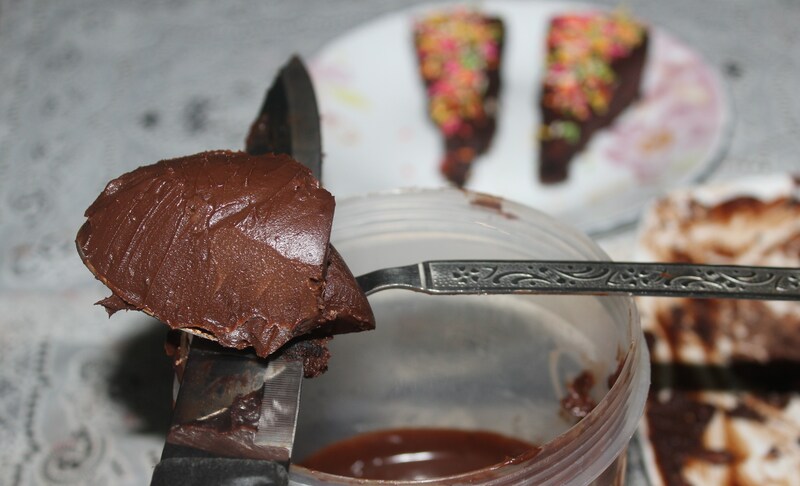 I have tried more than a couple of times with melted chocolate topping on my cakes – tasted wonderful but not good with its looks. Well, to achieve something you need to sacrifice something is a common phrase in Indian films and soaps since decades and no doubt that can be one of the heaviest truths of life too! So, I chose to achieve the goodness of chocolate icing not bothering about the looks of the finished product. I have also vowed to learn frosting swirls for my cup cakes. The warning signal has already been passed over to the ‘Tasting Duo of my Home’ – Father and Daughter Combo! I went in search for the basic dark chocolate ganache recipe with butter and framed these two..
and chose to stick to the second but learnt from the pictures of the first! 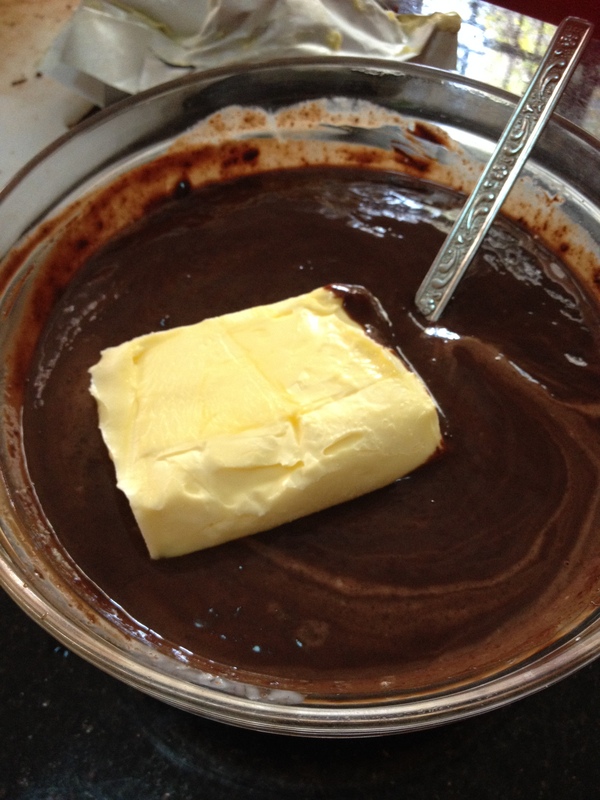 I took the 1:1 ratio for chocolate and cream and added butter for the extra shine and glaze of the icing. 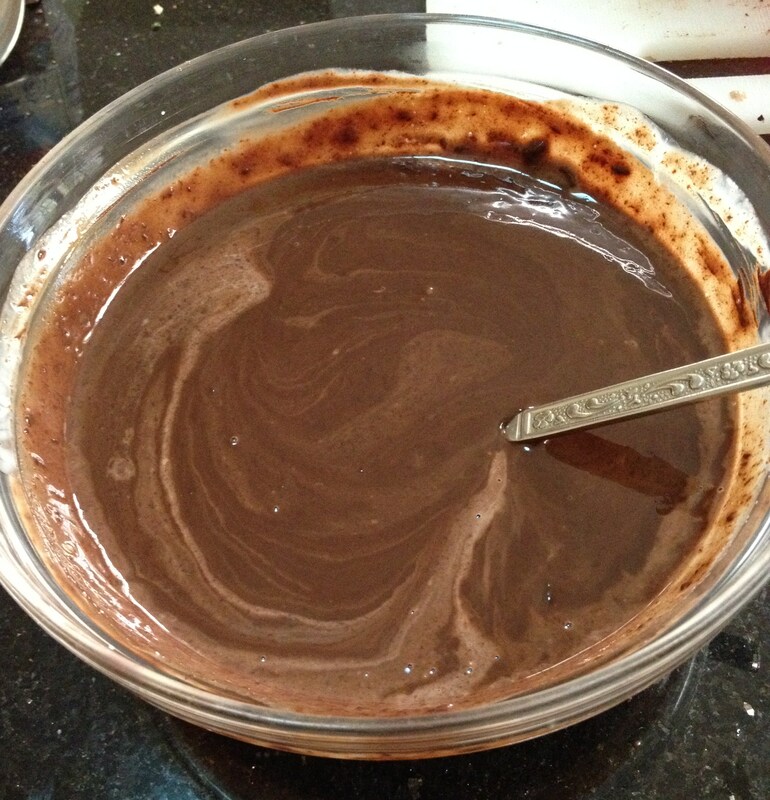 Chocolate Ganache is ready to be poured and spread on the cake. 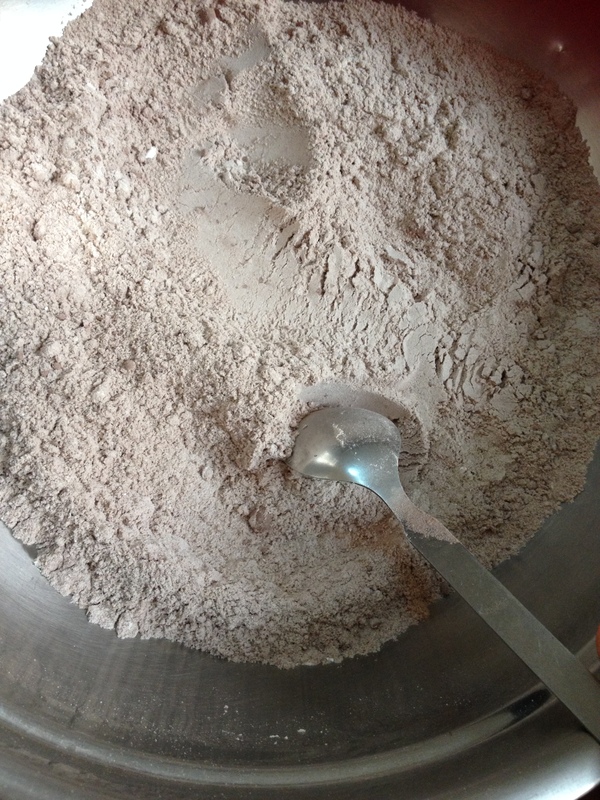 This quantity of ingredients for ganache gives about 3 to 4 cups of pourable consistency. It took less than half for the above chocolate cake. The rest that I have stored – can be stored for months. 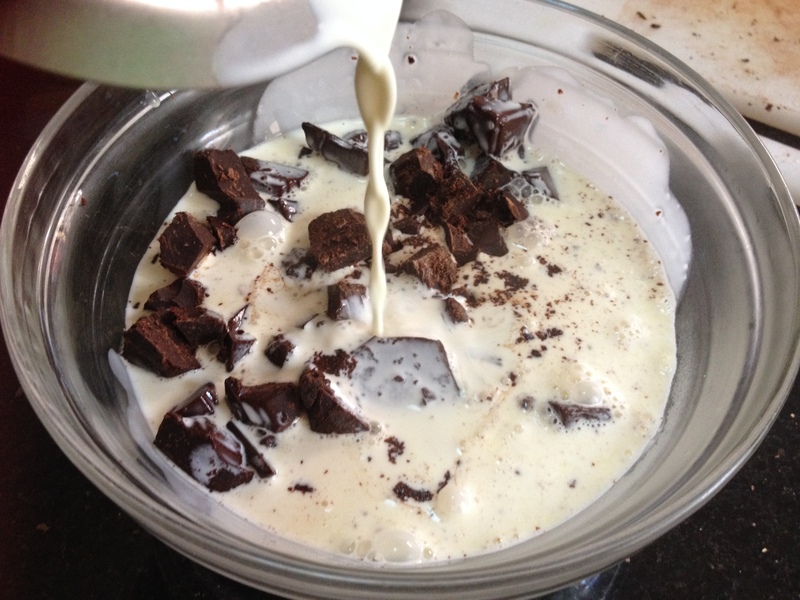 I plan to make choco-swirl icing or choco truffles too! I might try the swirls on a choco-chip vanilla cup cake!! 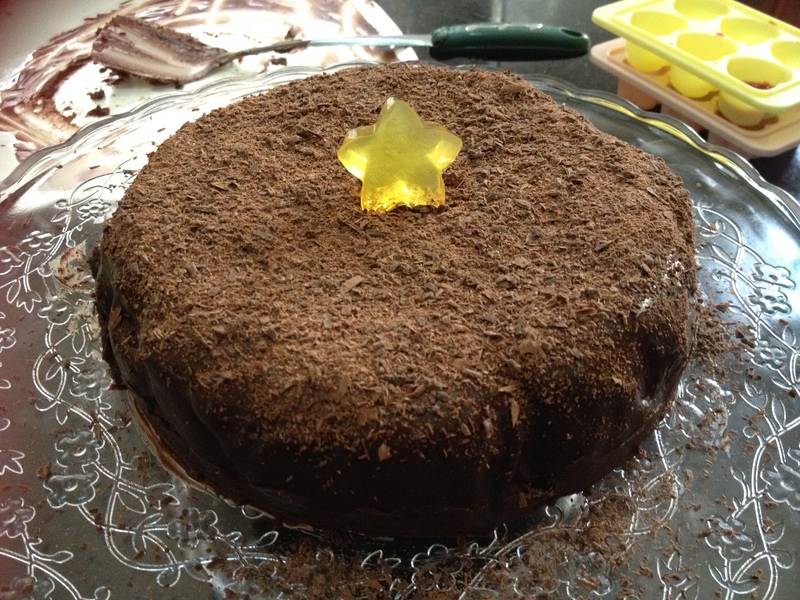 Now, I forgot to take a picture when the ganache was ready on the cake. Then, I started thinking of ways to decorate it – which as I said earlier – not my cup of tea still. I decided on chocolate curls and tried but turned out to be grated chocolate! 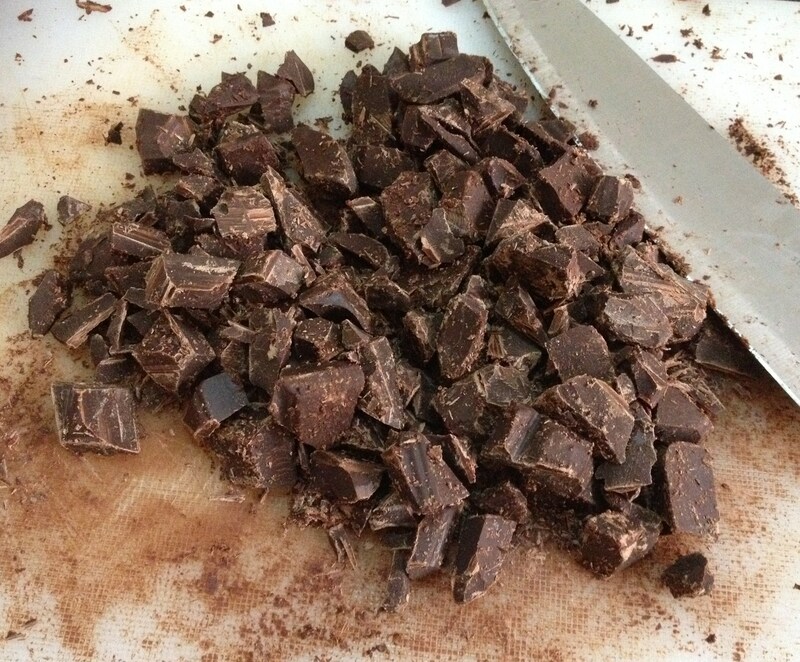 So, I spread the grated chocolate on top of the ganache… not really pleasing- but truly tasted good. 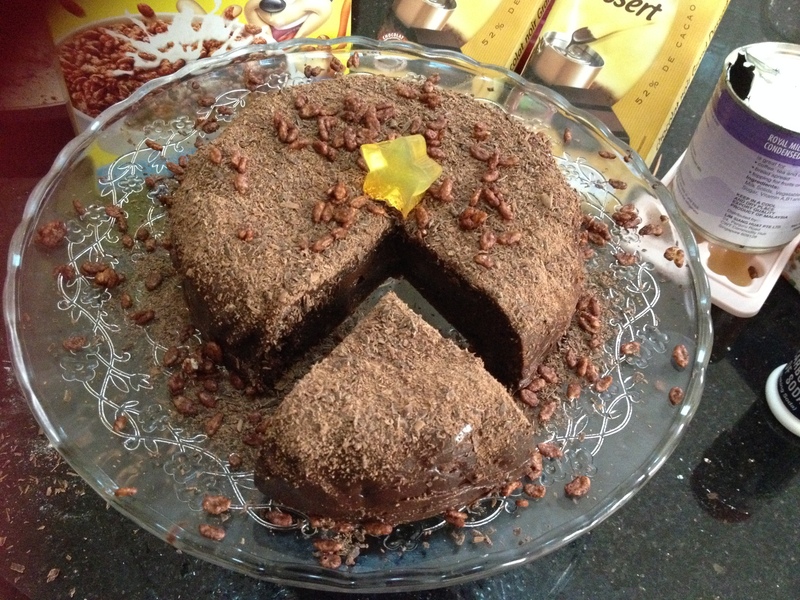 I had already kept the ganache in the fridge and it was set well. I took it out and spread it on the cake pieces and ended it like this!! 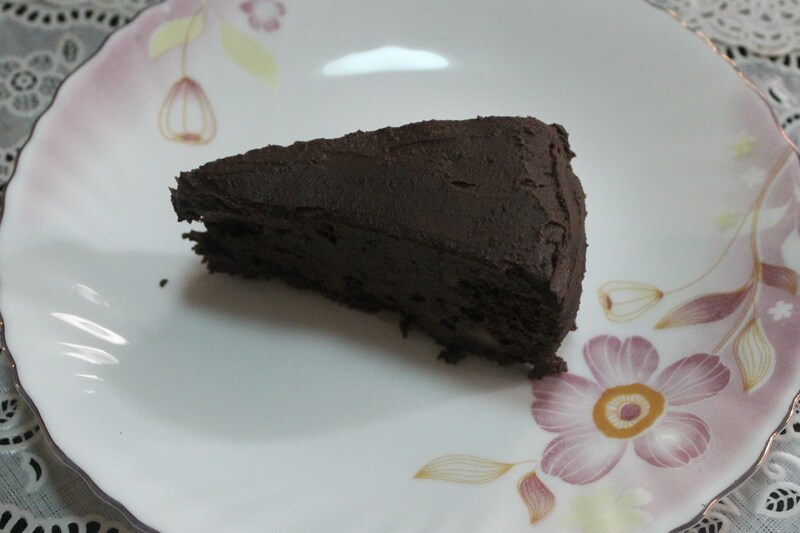 Believe me, the taste of Ganache was truly awesome.. just like the ones in those glass doored -wi-fied pastry shops! !